Pinar Cetin is the Director of the German Islam Academy (Deutsche Islam Akademie), which she founded in 2016 along with fellow members of the Muslim community in Berlin. From 2003 to 2016, Ms. Cetin was active in the Turkish Islamic Association for Religious Affairs in Germany (DITIB). Ms. Cetin studied Political Science and Turkish Studies at the Freie Universität Berlin. 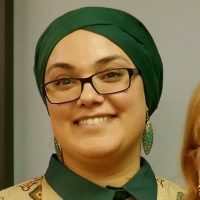 Throughout her career, Ms. Cetin has worked in a variety of projects, including as Dialogue Manager between Muslim and non-Muslim students and inter-religious groups. She conceptualized different workshops and worked on methods to facilitate community-based exchange and mutual understanding. Ms. Cetin was engaged in Jewish-Christian-Muslim encounters and helped develop educational programs at schools aimed at preventing prejudice and hate-based discrimination.